Dual wind spring design provides wind resistance. 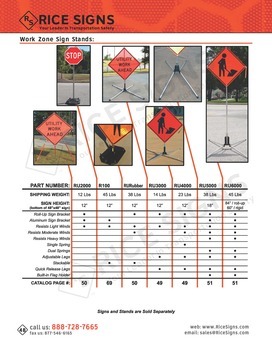 Sign stand has mounting brackets for both roll-up signs and aluminum signs. 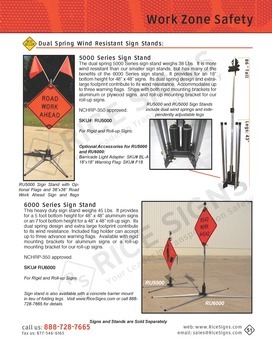 See Dual Spring Wind Resistant Sign Stand for Roll-Up and Aluminum Signs in our catalog on page 51. Our 38 lb. 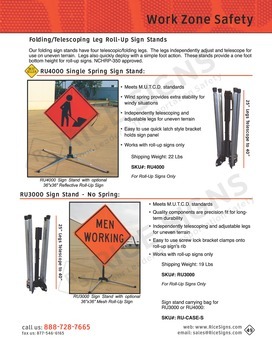 dual spring sign stand provides an 18 inch bottom height for 48x48 signs. Its dual spring design and extra large footprint contribute to its wind resistance. Accommodates up to three warning flags. Ships with both rigid mounting brackets for aluminum or plywood signs, and roll-up mounting bracket for our roll-up signs. Heavy duty springs deflect windload so that this sign stand can be used in both heavy traffic and very windy weather conditions. The springs will flex back and forth so that the sign stand will not tip over. 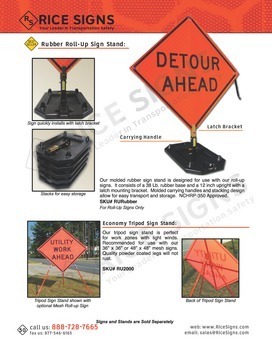 ACTION SHOT:Wind Resistant Sign Stand shown with optional 36"x36" reflective Utility Work Ahead roll-up sign. Large footprint of sign stand adds stability.